If you have ever needed to write letters, you may have seen a need to keep some letter templates in order to make the job of writing all the easier for yourself. 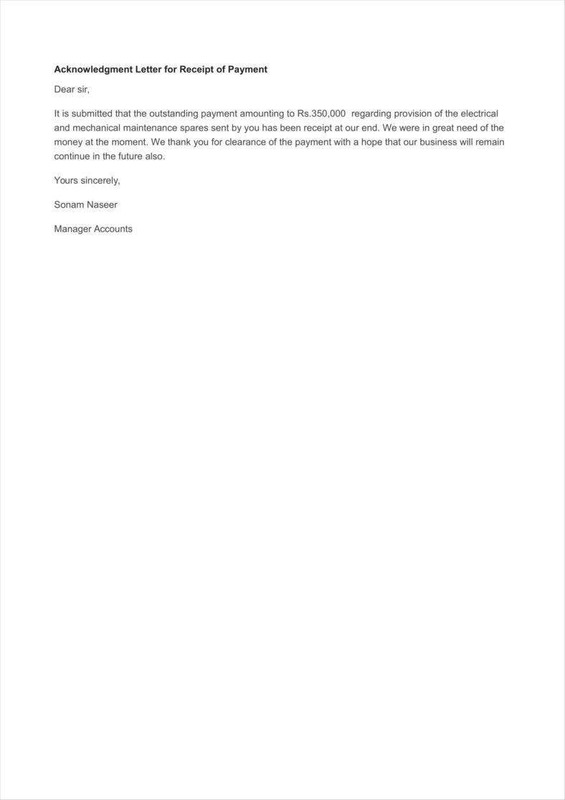 After all, it should be a fairly simple task to find HR acknowledgment letter templates, along with other examples of different acknowledgment letter templates. 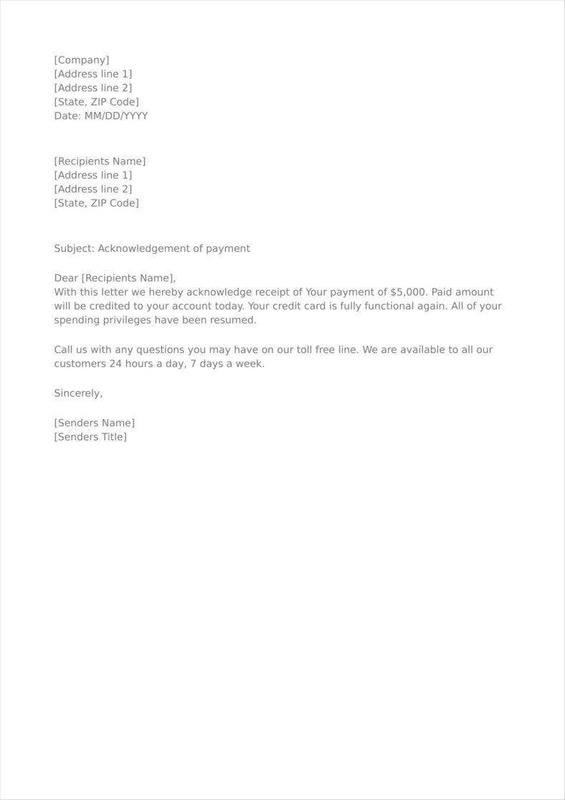 For example, you might want to find and use payment acknowledgment letter templates to make it easier to make letters related to that purpose. When writing any kind of letter, it pays to have the basic knowledge of how to write them, as would be the case in knowing how to prepare donor acknowledgment letters. In those cases, it is imperative that you know about some of the elements you would need to include in the letters so that they would be able to do their jobs properly. It might also help to have access to some tips that can modify how you use such templates in order to make sure that you are using them to the fullest. When writing business acknowledgment letters, or any other kind of acknowledgment letters for that matter, you should be aware of what components those letters need in order to fulfill their purposes. This is true of any kind of letter as there do have to be certain elements present in order for it to do what it is meant to do. This would be especially true if you want your letters to conform to the basic standards of formal letter writing since there are quite a number of standards that you would need to take the time to include. Every kind of official letter needs to include an official letterhead. In a way, the letterhead can be seen as a symbol representing the body that sent the letter. In the case of employee acknowledgment letters, that would be its parent company, though payment acknowledgment letters are hardly restricted to the use of companies. 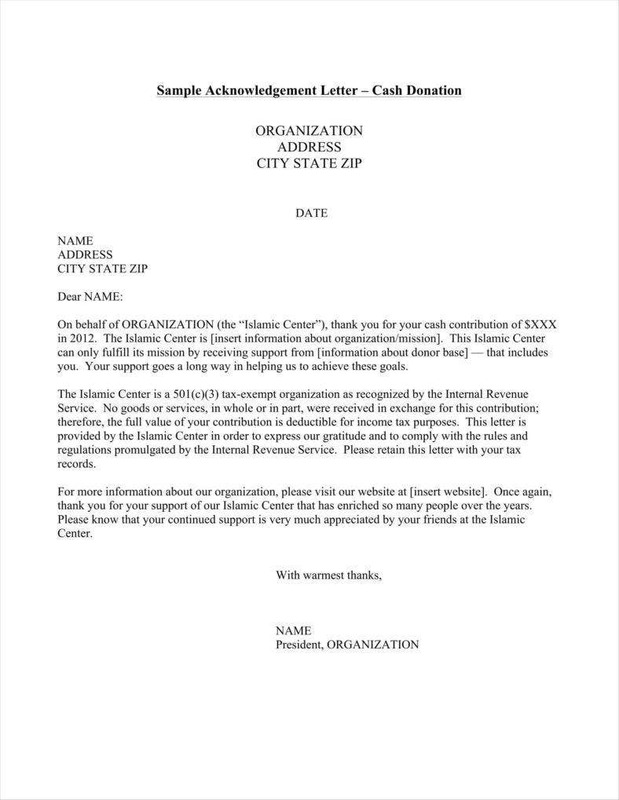 In any case, it is vital that you include a letterhead so that you can assure your recipient that the letter does come from an official source. Other than that, a letterhead can contain some other useful information such as contact details, which could prove useful in case there might be some lingering issues after having received the payment. It is also vital that you include all the dates relevant to the reception of the payment. The most significant of those would be the date the payment was actually received as this can help confirm when the payment was received vis-a-vis when the recipient of your letter actually sent it. Your recipient would be aware of when he sent the payment, so listing the date can help them check that all the dates are consistent with you, which can help you avoid any mix-ups with respect to the payment. 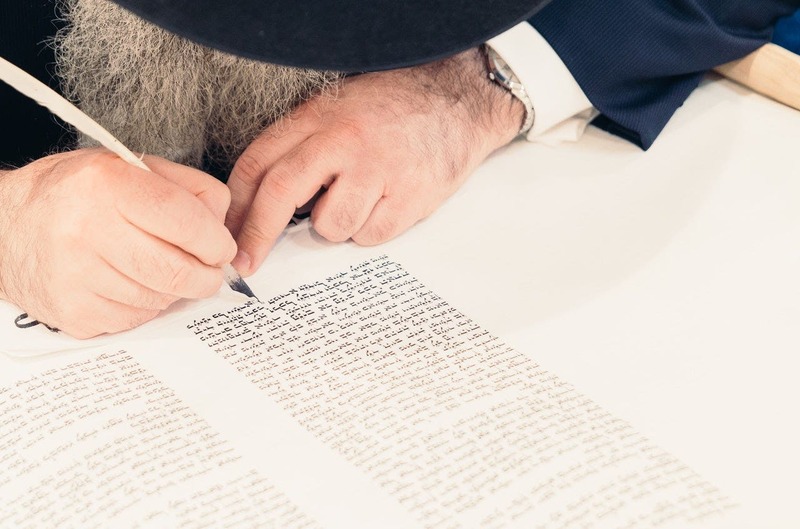 You should also take care to include the date you wrote the letter because this can serve to establish a timeline, particularly if this issue has persisted for some time. Naturally, this also makes it easier to make use of your letters as records of the payment and any related events since the date would make it easier to place the letter in time. Naturally, any letter would need to include the name of its recipient, primarily to ensure that the right person actually gets the letter. This is particularly important in the case of payment acknowledgment letters as there would be money involved; hence, it’s why it would be so important to make sure that correspondence reaches the persons they are meant to. Placing the recipient’s name on the letter can erase any doubts as to who the letter is meant for. Having the recipient’s name displayed prominently in your letter can also serve to give your recipient a greater sense of urgency, particularly if time is of the essence with regard to payments. 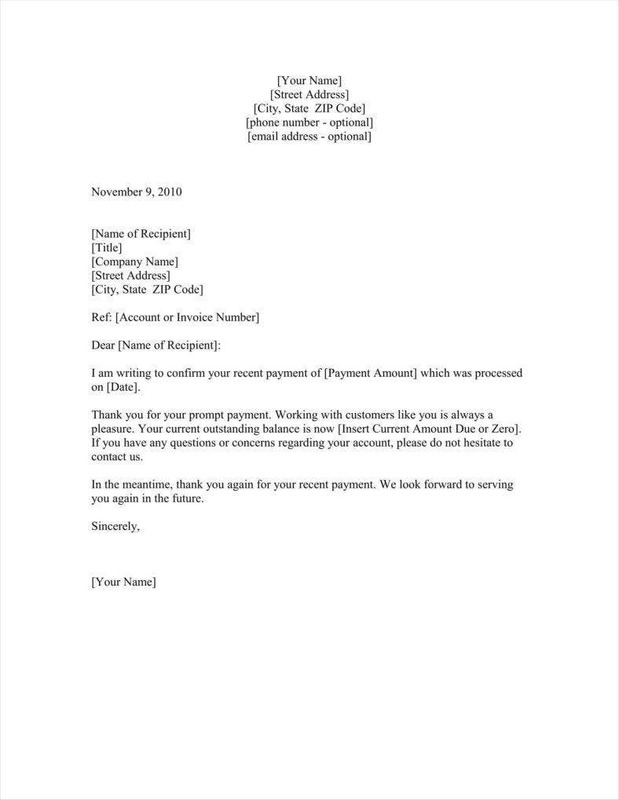 The recipient’s name also serves to confirm who it was that actually sent the payment since you and they could associate the name with whoever was recorded as having made the payment. 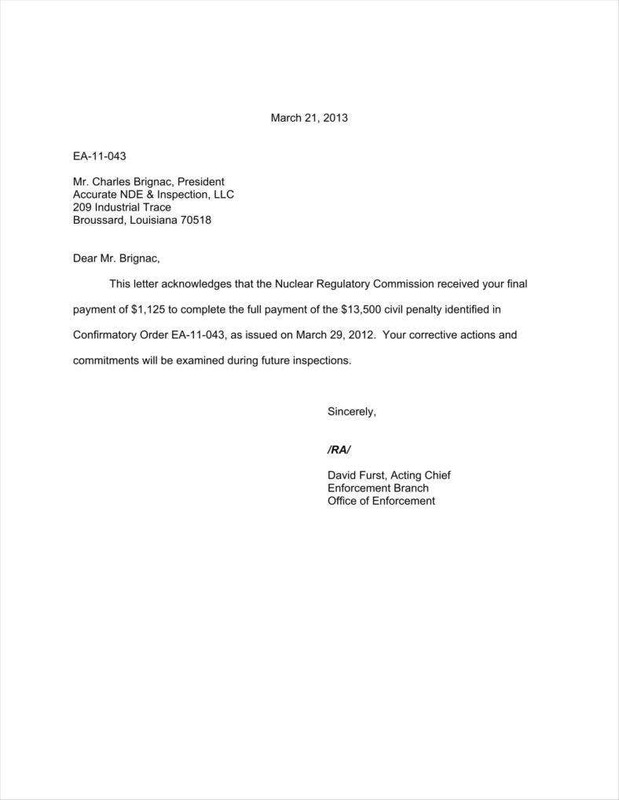 It is also vital that you include a direct confirmation of having received the payment. 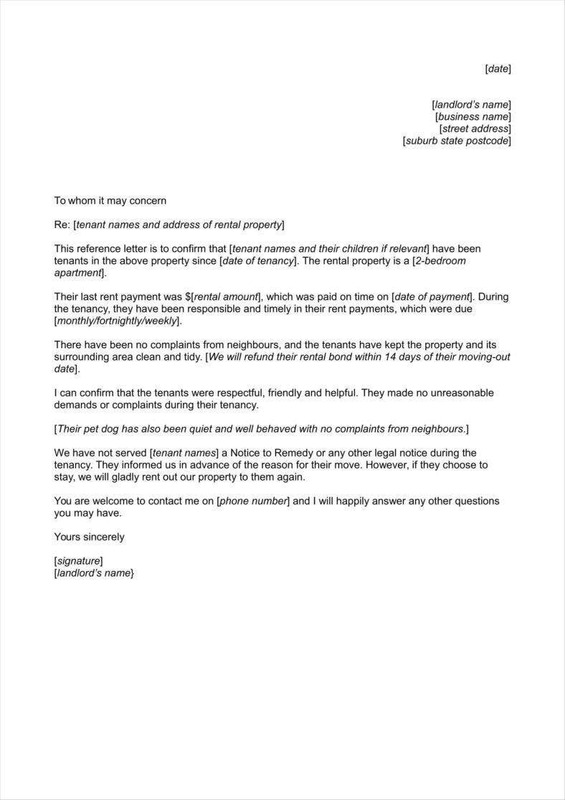 Indeed, this is the entire point of having made this letter in the first place, so it would be necessary to directly spell out to your recipient that you received their payment. The very point of acknowledging the payment is at least partially to inform the recipient that you received the payment and assure them that there should be no further concerns regarding the payment. This can both put an end to the issue as a whole as well as head of any issues since payment has already been received, which can serve to give more convenience for the recipient of your letter and yourself. Another aspect of acknowledgment letters is thanking their recipient for whatever service merited the letter in the first place. As such, you should take the time to state your thanks in your acknowledgment letter. Whether a donation acknowledgment letter or some other kind, it is always prudent to thank whoever paid you. In the case of a payment letter, this can serve to show your appreciation for the recipient, particularly if they paid promptly. Thanking your recipient directly may also serve as encouragement and incentive for them to do so again in the future, which can help secure more prompt payments later down the line. It may not seem like much, but expressing your gratitude can help to keep work flow more smoothly. This can ensure that work on both sides flows more smoothly to the benefit of all. 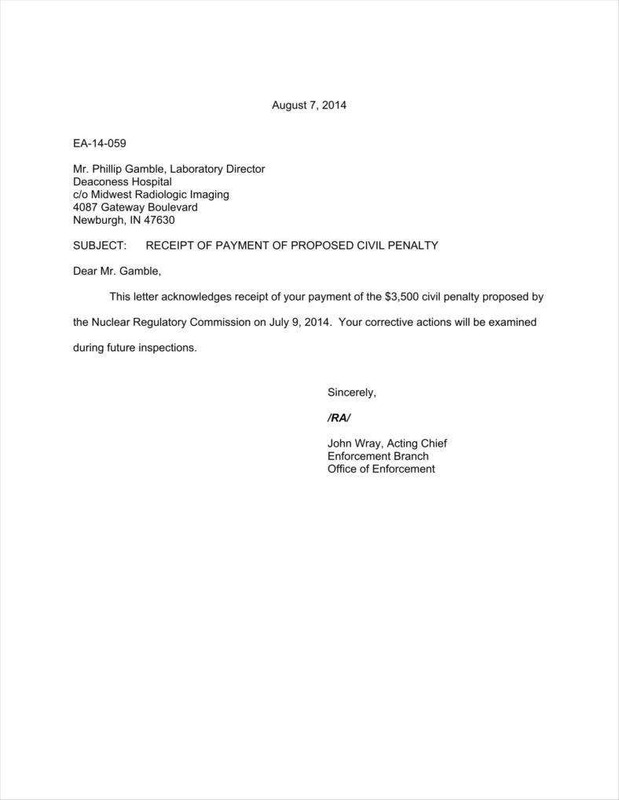 In order to make sure that your letter is as specific as possible, it pays to include the amount that was paid. If your letter really is meant to serve as further confirmation that you received payment, then you would naturally need to include the complete amount paid. This can serve to confirm with your recipient that the correct amount was paid. Other than that, your receipt acknowledgment letter templates can be used as records of the transaction, so it pays to make certain that you have listed the actual amount that you were given. This way, you can have all the records to show that the proper amount was paid and at the correct time, which would show whether both parties did everything that was necessary for the payment to be carried out properly. If the payment is not finished yet, then it would help to include the outstanding balance in order for your letter to serve as a reminder for the recipient. With that in mind, you would need to include the full amount that still happens to be left over so that your recipient can be kept informed. You can potentially use this to make sure that your recipient has a full idea of how much they still have to pay, which can make payments slightly more prompt thanks to having an idea of how much remains in their balance. This is not actually limited to amounts still due to you as this might still be applicable in the case of payments added to an account, such as with banks. As such, you could include the current balance of a given account in order to keep your recipient up to date concerning the actual amount. Last, of all, you would naturally need to include your own name and signature when writing receipt acknowledgment letters. There are a number of reasons why you might want to do this, the main one being that it would allow you to more easily establish some kind of connection with the other party, which could make future interactions flow more smoothly. Other than that, having your own name can serve to lend some extra credibility to the letter that can make it all the more believable to your recipient. After all, you would need to establish yourself as a representative of whatever body you are representing in order to fully convince your recipient that you are, in fact, on the level. Some other tools that you might be able to use in order to make the task of writing different kinds of business acknowledgment letters simpler are tips that can improve how you write them. These tips can also be applied to general payment acknowledgment letters, so you can very well get more out of these tips than you might expect at first glance. When you actually get to the task of writing, you would likely find yourself with a number of different templates to work with. 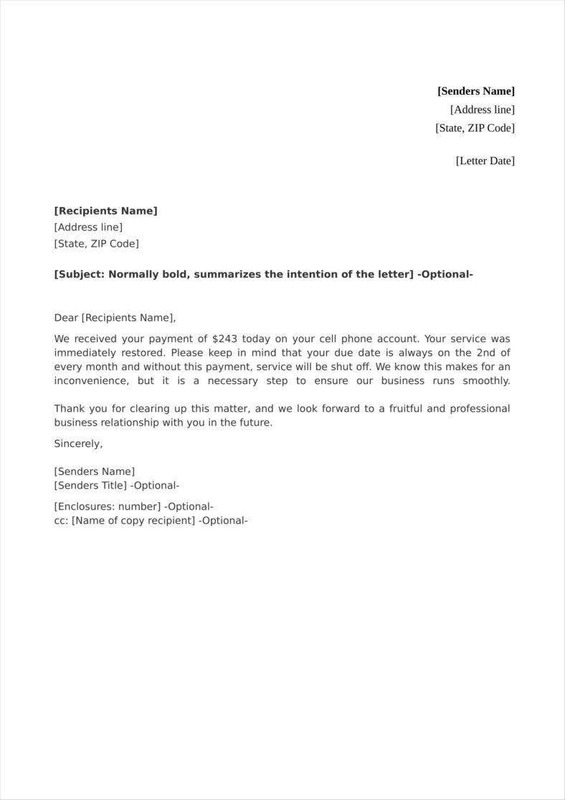 That there are so many templates available for you to use means that you ought to be more selective with which ones you use to write your payment acknowledgment letters. You should take care to use a template that actually suits your particular needs so that you can find something that reflects your situation. This also makes it easier for you to find a template that does not have to be modified as much, saving you time for other tasks. Like any other document, you should remember to take the time to check your payment acknowledgment letter templates before releasing them. This would allow you to catch any errors, particularly those regarding names and amounts. After all, it is vital that you make sure that this information is accurate in order for your letter to properly reflect your situation. This also applies to making sure that your letter has all the grammar spelled correctly. As official correspondence, it pays to make sure that your letter has been edited in order to preserve the gravity of the situation you are writing for. Some of your letters might have to do with settling debts or balances with your recipient. In those cases, you would need to make sure to take the balance into account so that your letter can convey complete information to your recipient. This can make it much easier to secure payments in the future since they can have an idea of how much balance remains, or how much they might want to contribute to it. When it comes to writing official company acknowledgment letters, you always have to remember to write in a polite, professional tone, which is true of any kind of official letter, not just payment acknowledgment letters. This is evident from the fact that you need to thank your recipient and encourage them to work with you again at some point in the future. This can also go some way toward ensuring that you do not burn any bridges unnecessarily so as to preserve as good a working relationship as possible. At the end of your letter, it might be wise to make sure to include a call to action of some kind. This can serve as a kind of push for your recipient to encourage them to keep working with you. This might be most evident in gift acknowledgment letters and donation acknowledgment letters as your encouragement might be seen as a way to get recipients to continue working with you. In the case of payment acknowledgment letters, this can be an offshoot of your statement of thanks, which can segue into encouraging your recipient to keep working with you. With any luck, the rest of your relationship has shown your recipient the benefits of continuing to work with you, such that your call to action can speak for itself. It might even be possible to use some of the advice on this page for other kinds of documents, such as resignation acknowledgment letters. But whatever kind of letter you use these insights for, it is very likely that you can have a considerably easier time of writing them than you otherwise would have.